Another day, another Mazda road test. But the very good excuse is that this time it's a Mazda 6 2.2 litre diesel, fitted with Mazda's all new chain cam diesel engine. 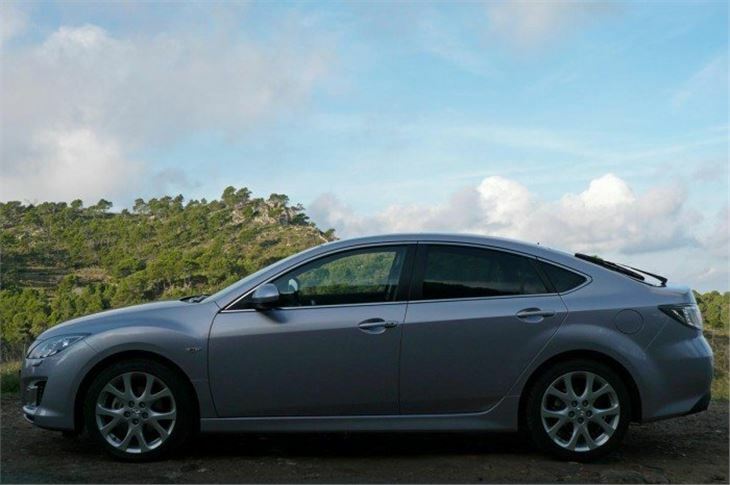 The current incarnation of the Mazda 6 has always been an impressive car. Very handsome, and easily confused in the mind, with the Honda Accord. You have to look twice to be sure which is which. But the engine range wasn’t as strong as the rest of the car. The 1.8 petrol engine is a very good 1.8, but the 2.0 litre doesn’t compare as well with other 2.0 litres, the 2.5 emits too much to get on most people’s shopping lists these days, and the 2.0 diesels, though strong, had been developing a bit of a reputation for turbo trouble in the old Mazda 6. What’s really special about the new particulate filter is that on the combined running cycle it only needs to regenerate half as many times, and the times spent regenerating are shortened by a third. That means less worry about the ‘depollution’ light coming on and better fuel economy because the engine burns less fuel regenerating. 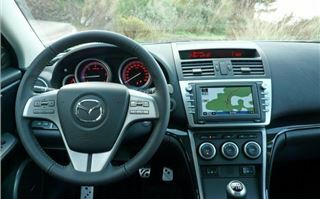 Volvo has its blind spot warning light and Mazda has come up with something similar, which it calls ‘Rear Vehicle Monitoring System’. This uses wide-angle 24Ghz microwave radar on both sides of the rear bumper to monitor the presence and speed of anything approaching in that area. 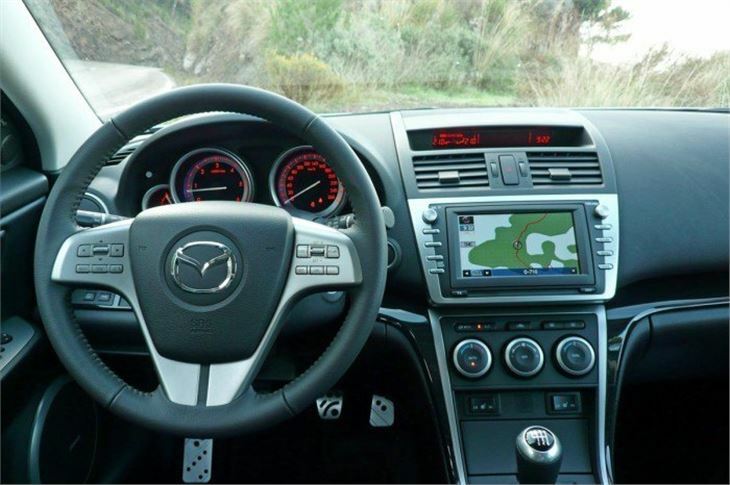 If it spots something, it warns you with a flashing light, and if the Mazda driver signals to change lanes it also emits a warning beep. Unlike mirrors, it works even in heavy rain or thick fog. It’s the sort of device that should be fitted to every LHD truck and van entering the UK, and every RHD truck and van entering mainland Europe. You get the Rear Vehicle Monitoring System as standard on TS2 spec, Sport and SL trim levels, and another benefit of the new diesel engine is that it allows the fitting of the Smart keyless entry and Start/stop button on the Sport and SL. 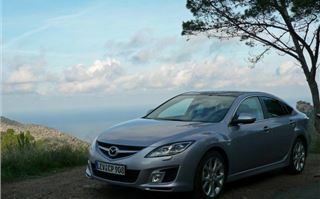 We drove first a mid-power 163PS wagon (the white car in the video), then a high-power 185PS hatchback (the silver car in the photos). 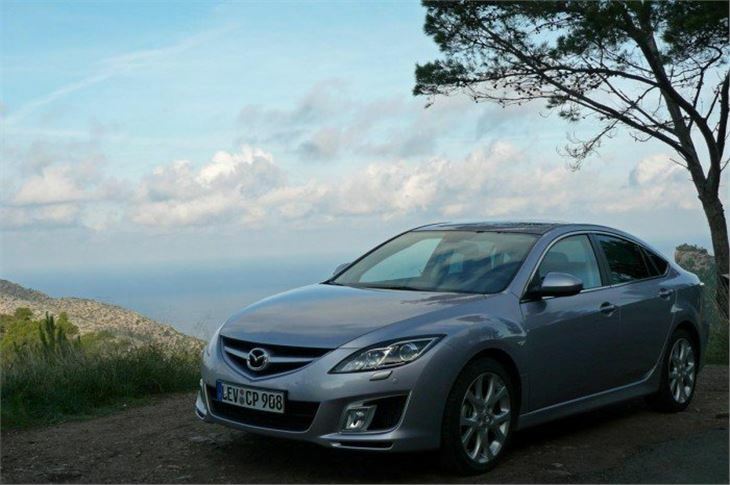 Though Mazda says you get maximum torque or 360Nm from 1,800rpm to 3,000rpm, you didn’t on our 163. There was a noticeable catapult effect at about 2,300rpm when the turbo wound up. However, it was happy to trickle down to 1,000rpm and even pull uphill in high gears from low revs, so it did prove to be a reasonable flexible friend. I’ve written about the handling before, which is excellent without resorting to different settings of ‘sport’, ‘standard’ and ‘comfort’ like a high spec Mondeo. You can switch off the ESP if you want, but these days I generally don’t want, at least on public roads, and the system is a sensible one that doesn’t come into effect unless the car (and you) really need it. You can have your fun and neat it. On the wagon, practical features abound, like the ‘Karakuri’ rear seats that flop down at the flip of a latch on the boot side, so you don’t have to mess around pulling knobs on the tops of the seats. The load area is long and flat. 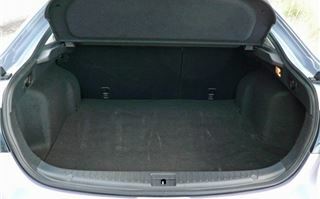 The load cover comes up with the hatchback lid. 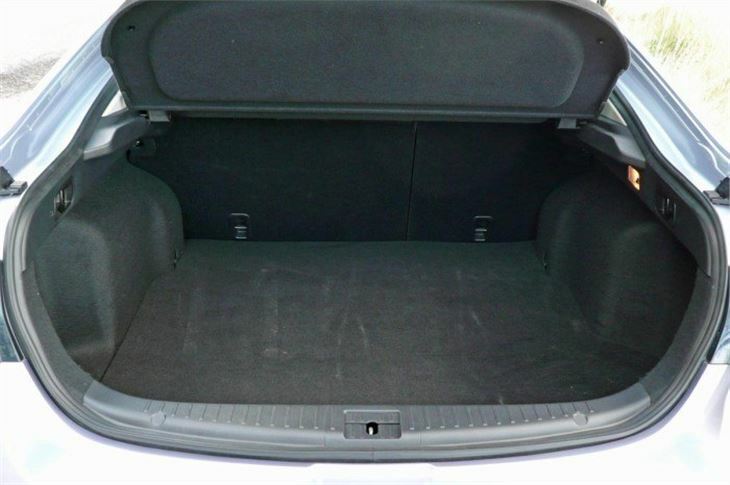 And, while there’s plenty of space for your bags behind, the back seats offer bags of head and legroom. Next day, we got out hands on a 185PS hatchback, and if you’ve got the extra cash this is definitely the one to go for. You get a lot more urge from lower revs whether you’re using the gears or not, and there is very little sacrifice in economy. Only £30 a year more tax, and then only if you go for the 185PS wagon. 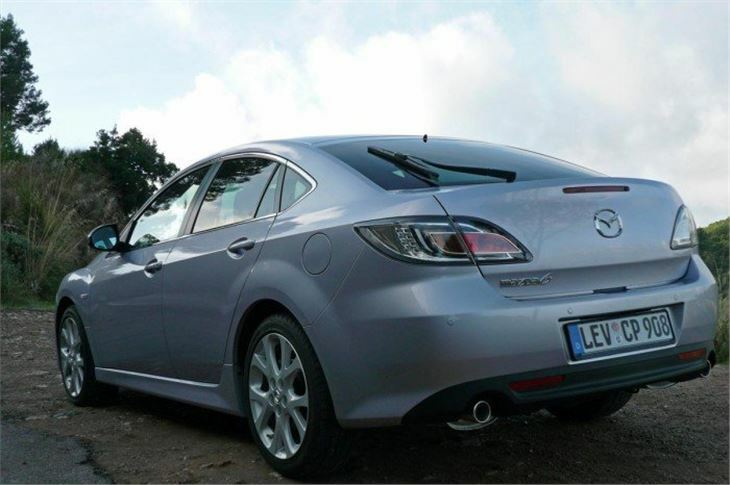 The 185PS saloon and hatchback stay under 150g/km. This really is a sports diesel, and possibly the best ‘D sector’ front drive diesel you can buy. It grips tenaciously and the steering is sufficiently informative to tell you the instant it finally starts to lose adhesion so you can take appropriate action. If you don’t, and have left the ESP on, then the system will do it for you. And it manages all this with impressive seat and rid comfort, despite 215/50 R17 tyres (I don’t recommend going up to 18”). Our test route managed to throw up a stretch of urban road that somehow contrived to be worse than anything in the most socialist of London boroughs. So, an excellent car, now with the engines it always deserved, much better than the Passat, 407, C5 and new Accord, slightly sportier than the Mondeo, superior to the new Superb. The Laguna GT might give it a run for its money. 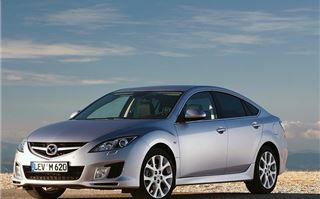 I can’t tell you how it compares to the Insignia because Vauxhall doesn’t appear to want to let me drive it. 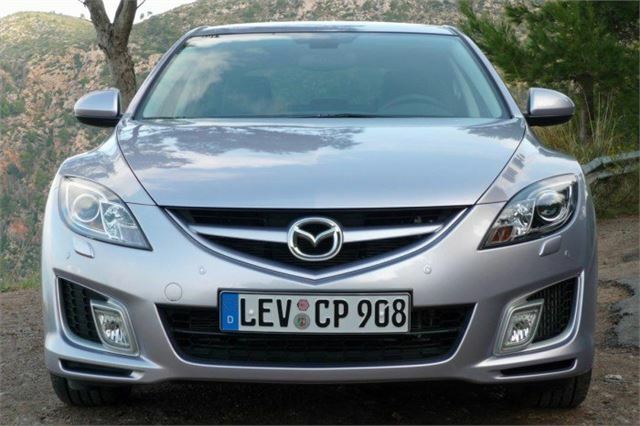 And I’ll know where is sits against the new Avensis in December.